Accessibil-IT converts your PDFs into accessible versions for people who have visual or cognitive disabilities. We’ve dedicated ourselves to the craft — we participate in leading global committees and understand the technical standards inside and out. Converting a PDF is not as simple as pressing a button. Achieving full accessibility goes far beyond adding tags and ALT-Text. Why? It’s the attention to detail that matters, and automated tools can’t replicate that. We ensure your document’s reading order remains accurate, with ALT-Text that conveys your image content. Original branding is maintained, and navigation features allow high-quality user experiences. What are accessible PDFs? They’re the key to giving all of your visitors the opportunity to access and navigate your document or fill out your forms — and the way to achieve compliance with PDF/UA and WCAG 2.0 standards. Up to 20% of web users suffer from some form of visual impairment; they could be your employees, prospects, or customers. Accessible PDFs ensure your content will never leave them lost in the darkness. We work with you to find cost-effective solutions. Email us your PDFs – it’s as simple as that. 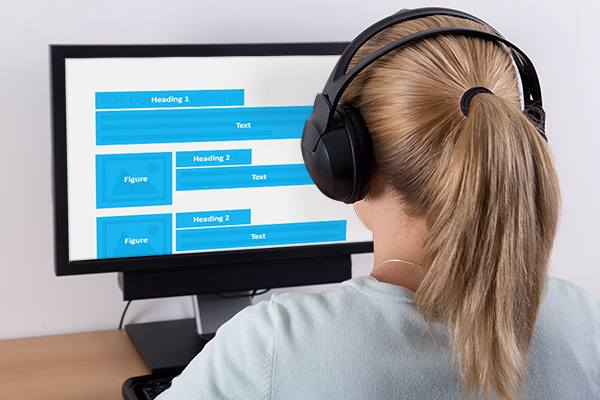 PDFs are reworked to become accessible and interactive with assistive technologies. We’ll send back compliant, highly-usable PDFs ready to go.